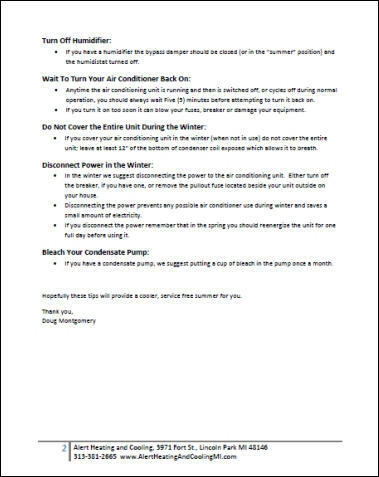 ALERT HEATING & COOLING INC.
Download and print our Air Conditioner Maintenance and Troubleshooting Guide. • Turn your thermostat off. • Go outside and clean your condensing unit off with a garden hose for about TWO (2) minutes or until any debris washed off. Let it dry for about TEN (10) minutes then turn your thermostat back on. The idea is you want to keep the coils dirt-free. You don’t have to take the air conditioner apart. • This step is especially important if you are near a cottonwood tree. • I recommend that you check it every month. A dirty filter will not allow air to flow freely. • Hold filter up to light or sunlight to see if it is dirty and needs changing. • If the batteries in your digital thermostat are low, it won't call for your air conditioner to come on. • Normal battery replacement schedule is every TWO (2) years. • To check if you need Freon check the temperature of the large copper line coming from your air conditioning unit into the house. • Perform the check on a warm day (over 80oF) after the air conditioner has been running for five (5) minutes. • If the line is cold you are fine, but if it is warm you probably need a Freon charge. • If your unit won't come on, check your fuses and/or circuit breaker. • Keep the basement supply registers CLOSED in the summer. • During hot weather (above 90oF) if you have interruptible electric for your air conditioner, and it is during off cycle, the little red light will come on outside near the meter. • Be sure NEVER to set the thermostat below 70oF, and if the weather outside drops below 60oF outside your air conditioner should not be on. Your system was not designed to run under these conditions. • If you have a humidifier, the bypass damper should be closed, or in the summer position, and the humidistat turned off. • Anytime the air conditioning unit is running and then is switched off, or cycles off during normal operation, you should always wait Five (5) minutes before attempting to turn it back on. • If you turn it on too soon it can blow your fuses, breaker or damage your equipment. If you cover your air conditioning unit in the winter (when not in use) do not cover the entire unit; leave at least 12" of the bottom of condenser coil exposed which allows it to breath. 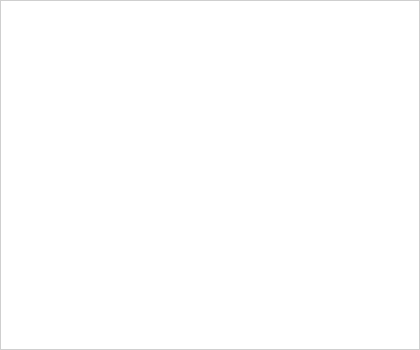 • In the winter we suggest disconnecting the power to the air conditioning unit. Either turn off the breaker, if you have one, or remove the pullout fuse located beside your unit outside on your house. • Disconnecting the power prevents any possible air conditioner use during winter and saves a small amount of electricity. • If you disconnect the power remember that in the spring you should reenergize the unit for one full day before using it. • If you have a condensate pump, we suggest putting a cup of bleach in the pump once a month. Hopefully, these Air Conditioner Maintenance and Troubleshooting Tips will provide a cooler, service free summer for you. 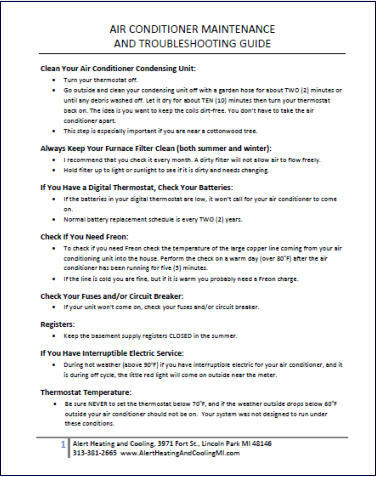 Thank you, Alert Heating and Cooling Download and print our Air Conditioner Maintenance and Troubleshooting Guide. 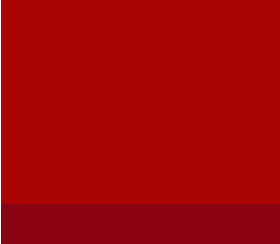 © Alert Heating and Cooling, 3971 Fort St., Lincoln Park MI 48146 tel. 313-381-2665 Downriver Detroit, Wayne County, Michigan including Lincoln Park, Allen Park, Brownstown, Dearborn, Dearborn Heights, Ecorse, Flat Rock, Taylor, Trenton, Woodhaven, River Rouge, Riverview, Rockwood, Romulus, Southgate, & Wyandotte.